Poboży T, Kielar M, Miąskiewicz J. Ultrasound-guided biodegradable subacromial spacer implantation in a patient with massive irreparable rotator cuff tears. Videosurgery and Other Miniinvasive Techniques. 2018;14(1):145-148. doi:10.5114/wiitm.2018.77555. Poboży, Tomasz, Maciej Kielar, and Jakub Miąskiewicz. 2018. "Ultrasound-guided biodegradable subacromial spacer implantation in a patient with massive irreparable rotator cuff tears". Videosurgery and Other Miniinvasive Techniques 14 (1): 145-148. doi:10.5114/wiitm.2018.77555. Poboży, Tomasz et al. "Ultrasound-guided biodegradable subacromial spacer implantation in a patient with massive irreparable rotator cuff tears." Videosurgery and Other Miniinvasive Techniques, vol. 14, no. 1, 2018, pp. 145-148. doi:10.5114/wiitm.2018.77555. Biodegradable subacromial spacer implantation (Photo 1) offers a chance for a normal life to patients with massive, irreparable rotator cuff tears [1–3]. This relatively low invasive method has been the established standard of treatment [4–8] and can be accomplished with ultrasound guidance and local anesthesia. 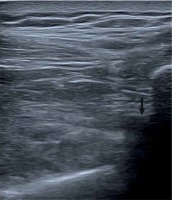 The use of trapezoidal ultrasound imaging or the use of a convex probe enables the operator not only to examine the area underneath the acromion and visualize the upper part of the glenoid cavity along with the corresponding part of the glenoid rim but also to visualize any implants, needles, and other instruments inserted into this region during the procedure [9–11]. Notably, all this is achieved with nothing more than local anesthesia with suprascapular nerve block. The female patient was admitted to the hospital because of a massive rotator cuff tear in her right shoulder, most likely sustained several months previously. The tear was confirmed ultrasonographically. The patient had medical contraindications for general anesthesia and long-lasting surgical procedures. At the time of the procedure (2015 Jan), the patient was 73 years old (height 158 cm, weight 56 kg). The condition of her glenohumeral joint on physical examination preceding the procedure was as follows: abduction up to approximately 60°, joint crepitations, decrease in muscle strength (3/5), positive Hawkins and Neer subacromial impingement signs, and radiographic evidence of a significantly narrowed subacromial space. The patient received a subacromial spacer (balloon), size M (middle), under ultrasound control with confirmation under fluoroscopy and arthroscopy. The patient stayed in the hospital for a total of 3 days. Immediately after the procedure, we observed a significant improvement in the range of motion and pain severity. Two days after the procedure, the limb was no longer immobilized, allowing for active movements. We assessed the length (size) of the balloon for implantation by measuring the distance from the lateral border of the acromion to the point located 10 mm medially to the superior rim of the glenoid cavity. This assessment was conducted with a long needle for injections (1.00 × 120 mm – TSK Laboratory, Japan). 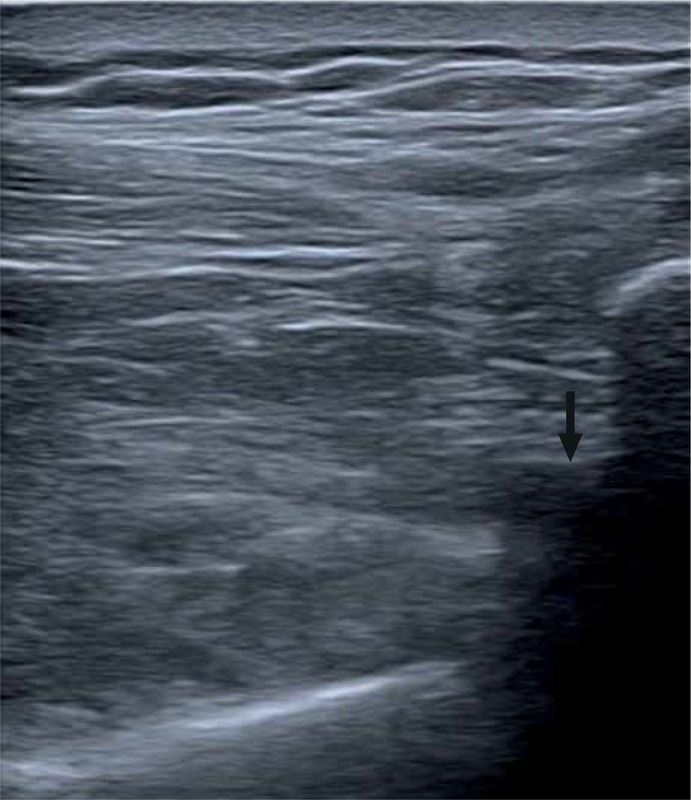 Subsequently, the subacromial bursa was anesthetized, a needle was inserted from the side into the site located 10 to 15 mm medially to the superior rim of the glenoid cavity, and the tip of the needle was positioned in such a way as to be visible on the ultrasound monitor at the site where the balloon-containing introducer cannula would eventually be placed (Photo 2). 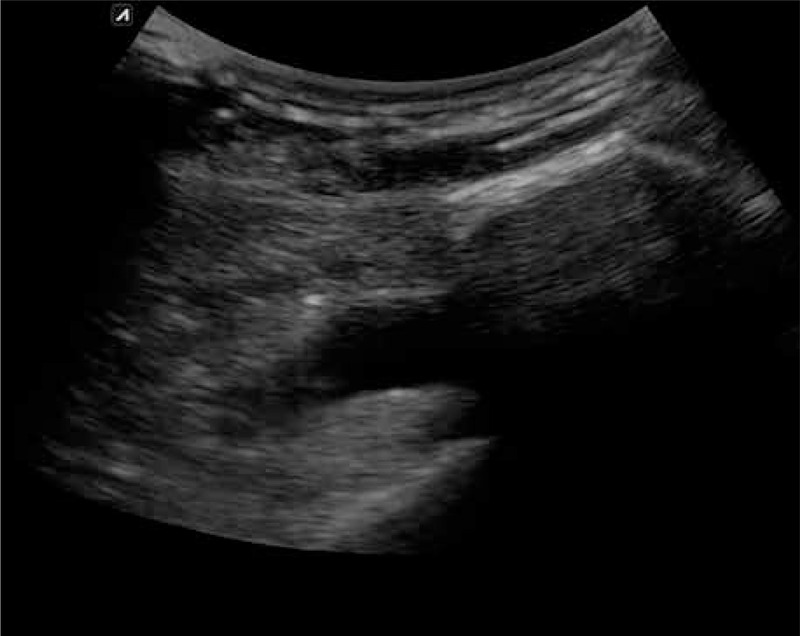 Additionally, we palpated (and visualized with ultrasound) the lateral border of the acromion in order to rest the tip of another same-length needle against this osseous marker. Subsequently, based on the difference in the lengths of the parts of the needles remaining outside, we estimated the size of the balloon to be deployed in the subacromial space. After determining the balloon size, we inserted a balloon-containing introducer under ultrasound guidance so that its tip was located above and approximately 10 mm medial to the superior rim of the glenoid cavity. 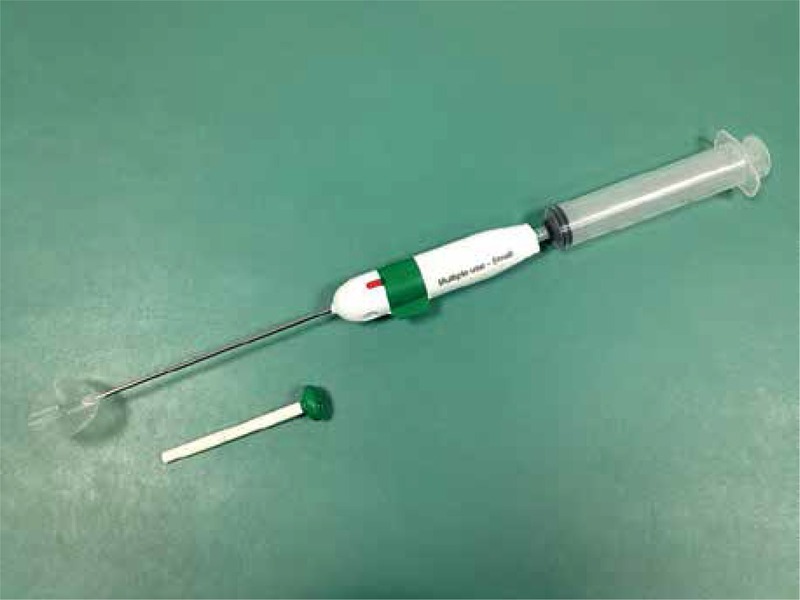 After inserting the balloon introducer into the desired position in the subacromial space, the introducer was withdrawn and the balloon was inflated with saline solution (0.9% NaCl) to the volume suitable for the given balloon size (Photo 3). Subsequently, an appropriate volume of saline was withdrawn, according to the requirements of the given procedure, to ensure the full range of motion (Photo 4). Then, the appropriately inflated balloon was detached from the inflation line and left in the subacromial space [4–7, 12]. We conducted the procedure with local anesthesia, with the patient in the beach-chair position. Approximately 3 ml of 1% lignocaine was used to anesthetize the skin and deeper tissues for lateral port placement (this port was later used for introducing the catheter with the spacer). Subsequently, a needle was inserted under ultrasound guidance into the subacromial space above the superior part of the glenoid rim. The anesthetic (15 ml of 0.5% Marcaine solution + 5 ml of 2% lignocaine) was injected as the needle was slowly withdrawn. Additionally, the suprascapular nerve in the area of the suprascapular notch was anesthetized (also under ultrasound guidance) with 10 ml of 0.25% Marcaine. We also assessed the outcome of the procedure with the Constant score [6, 8, 11, 13–15]. 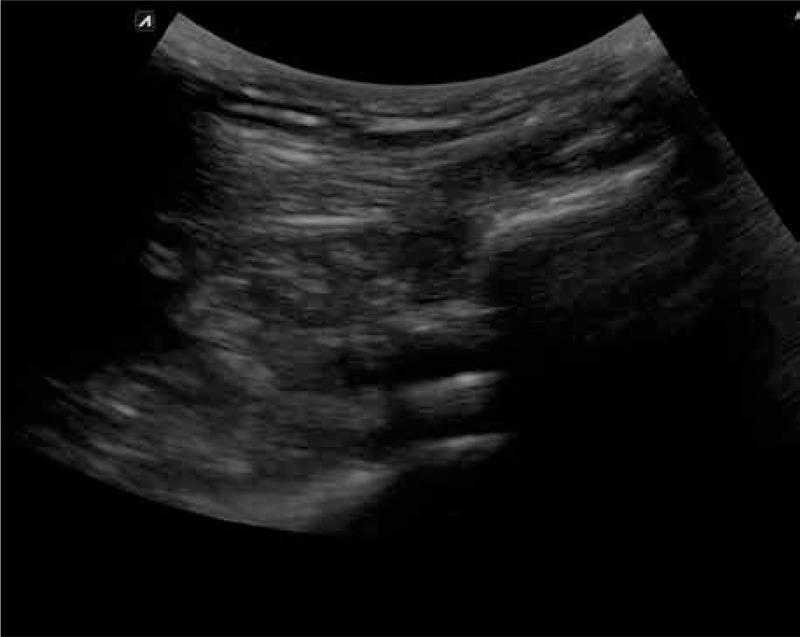 The patient underwent ultrasound examinations in the postoperative period. Less than half a year after the procedure, the patient exhibited the full range of motion in the shoulder and a high level of satisfaction with the outcome of the procedure (Constant score: pain 0 vs. 15; activity 4 vs. 20; range of motion 12 vs. 34; strength 0 vs. 12; total 16 vs. 81). The Constant score questionnaire was used 2 weeks prior to and 2 months after the procedure. The implanted balloon underwent partial degradation within the 5-month follow-up, with only a slight posterior displacement. However, what was interesting in this case was the fact that a relatively thick (approximately 3.4 mm) layer of scar tissue formed at the place that was occupied by the implanted balloon at the site of the rotator cuff tear. 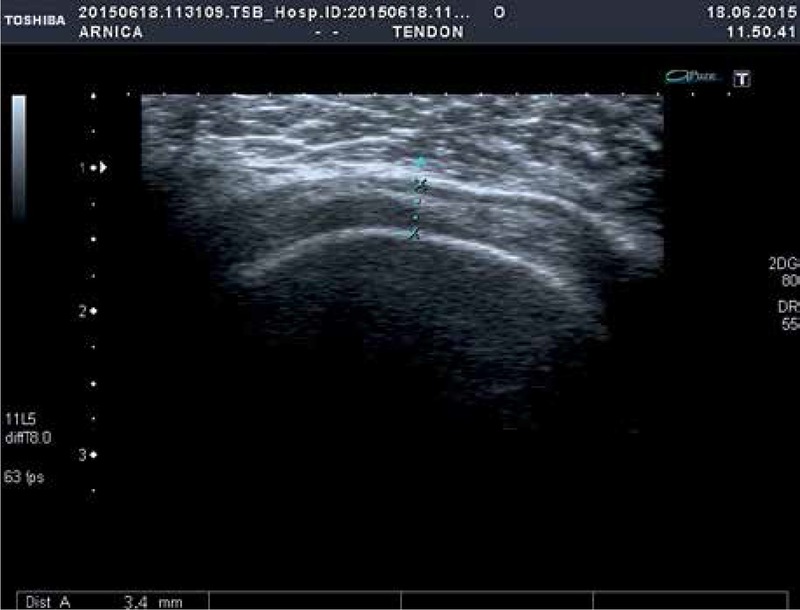 This scar tissue continued to isolate the humeral head from the acromion despite the fact that the partially degraded balloon had lost its properties, as visualized via an ultrasound examination (Photo 5). Earlier reports on the use of subacromial spacers as an innovative technique in arthroscopic surgery in patients with massive irreparable full-width rotator cuff tears appeared in 2012 [4–8, 12, 16]. The authors of those, and subsequent, reports claimed that implanting a biodegradable balloon into the subacromial space should reduce friction and improve joint mobility by lowering the humeral head. However, it is still too early to assess long-term outcomes of this treatment approach, though the findings of a 3- and 5-year follow-up in 20 patients presented by Senekovic et al. [5, 8] are promising. The implanted spacer undergoes complete degradation within 12 months. Although it seems obvious that an inflated spacer isolates the humeral head from the acromion, the continual pain-free shoulder motion and maintained good shoulder function in the period beyond 12 months, i.e., when the spacer had already undergone disintegration , are still not entirely understood. Our findings, namely, scar tissue formation in the subacromial space, may help explain this conundrum. 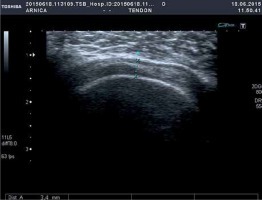 As far as we know, this is the first report on the use of ultrasound as the main imaging technique to ensure visual guidance during all steps of subacromial spacer implantation with local anesthesia in a patient with massive irreparable rotator cuff tears. At the end of the follow-up period (5 months), the patient showed favorable signs in the form of a layer of scar tissue that isolated the humeral head from the acromion, resulting in significantly increased joint mobility, pain alleviation, and improved quality of life. The procedure presented here is not a novel technique. It is a modification of an established approach and should be treated as a complement to the techniques already used for subacromial spacer implantation. This treatment approach can be recommended and may be warranted in certain clinical situations; however, further studies are needed. 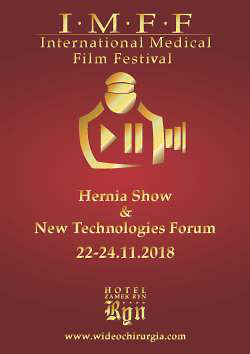 Copyright: © 2018 Fundacja Videochirurgii This is an Open Access article distributed under the terms of the Creative Commons Attribution-NonCommercial-ShareAlike 4.0 International (CC BY-NC-SA 4.0) License (http://creativecommons.org/licenses/by-nc-sa/4.0/), allowing third parties to copy and redistribute the material in any medium or format and to remix, transform, and build upon the material, provided the original work is properly cited and states its license.